these two regions. Originally known as "stracchino di Gorgonzola", after the eponymous town near Milan, where this cheese presumably orgininated in the 9th C.
A cooked, full-fat, semi-hard cheese from the Friuli-Venezia Giulia region. 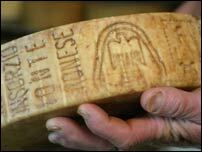 The Montasio has a smooth and even rind and a light yellow paste (with small eyes). Montasio exists in three varieties according to the ageing period: fresh (2 months), semi-aged (4 to 10 months), aged (over one year). 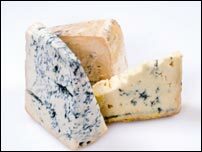 The first two types are table cheeses, while the aged variety may also be consumed as grating cheese. Grana Padano originated in Lower Lombardy in the 12th century. It is a semi-fat hard cheese, which is cooked and ripened slowly (one to two years) and the best selling cheese world-wide. Grana Padano is often mistaken for Parmigiano. "Grana Padano" ( first known as "Grana Lodigiano") and "Parmigiano-Reggiano" are considered two separate cheeses since the Stresa Convention of June1st, 1951. The Grana Trentino mountain cheese belongs to the Consorzio di Tutela del formaggio Grana, but uses the subdenomination "Trentino", according to a specific derogation. A cylindrical, semi-cooked, semi-hard cheese made from cow's milk which is produced in the Province of Verona. Monte refers to a production technique where the cow milk used for the curdle stems from different milkings. Monte Veronese cheese comes in three types: "with whole milk" (a latte intero) with a green label; "semi-aged" (d'allevo mezzano) with a blue label, and "aged" (d'allevo vecchio) with a black label. The fragrant taste of the young Monte Veronese becomes slightly sharper by ripening. According to the stage of ripening, Monte Veronese may be used a table or grating cheese. A generic term for "spun" paste cheeses obtained through a specific production method (pasta filata method) during which the cheese paste is spun (stretching and kneading it to obtain the right consistency), after which it is cut off to the desired size (mozzare). 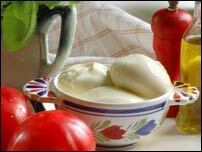 The finest mozzarella is that obtained from buffalo milk (mozzarella di bufala). Traditionally, Mozzarella referred to a raw, spun cheese. Today Mozzarella is sold in different types (fresh, smoked, leaf-wrapped, stuffed or seasoned) and in different shapes and qualities (in descending order: mozzarella di bufala Campana, mozzarella di buffala, mozzarella tradizionale, mozzarella fior di latte). The best mozzarella is still found south of Naples near Battipaglia and Caserta where it is made of raw milk following the traditional recipe. Unfortunately, this type of mozzarella has a very short conservation time and will rarely be found outside its original region. Murazzano is a soft, dense, rindless cheese produced in Piedmont from raw or pasteurized ewe's milk (min 60%) and cow's milk (max 40%). Traditionally, Murazzano was produced only from milk of the native sheep breed Pecora delle Langhe (Langhe Sheep). The cheese is dry-salted and natural aromas such as truffle, hot pepper, herbs or rosemary may be added. Photos: Gorgonzola © Juan Monino; Mozzarella © Ewa Kubicka.